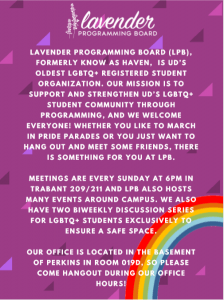 Lavender Programming Board (LPB) is the University of Delaware’s largest Lesbian, Gay, Bisexual, Transgender, Queer and Questioning (LGBTQ+) Registered Student Organization (RSO). We use the plus symbol to emphasize that identity is not limited to these six labels. For more information about identity terminology, please see here. 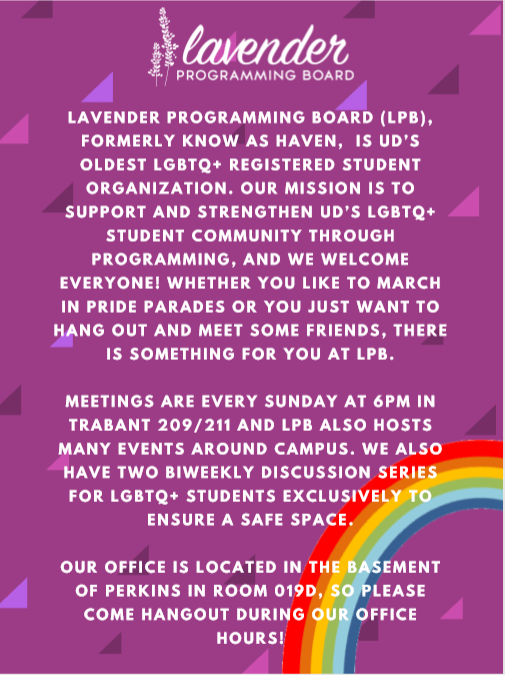 We are a University-funded and student-run club and though our meetings and events are geared towards members of the LGBTQ+ community and their allies, all, including but not limited to students and faculty of the University of Delaware, are welcome to come. We are also a safe space where members of the queer community can meet other queer individuals and be open about themselves without fear of judgment. We have our meetings every Sunday at 5 PM, in room 209/211 on the second floor of the Trabant University Center. Our meetings vary between educational topics and social events, all centered around queer identity and the queer community. Will I be the only one there if I come? Rest assured, you will NOT be the only person there. If you feel uncomfortable about coming, you can contact one of the officers, and they can set you up with an informal meeting with one of our members, so if you decide to come, you will know someone and not feel left out. Why should I come to an LPB meeting? Everyone has a different reason for coming to our meetings. Some come to meet people just like them so they don’t feel so alone on campus. Some come because it’s a fun way of staying informed about Haven events. Some people come to become more educated about the LGBTQ community. Being part of a fun and educational community is another reason that people choose to come to LPB. Others come because it’s one hour a week when they can be whoever they want to be. Why is your logo lavender? Our logo is lavender because in WW2, gay men wore a pink triangle and lesbian women wore a black triangle. It’s been said that if you overlap pink and black, they make lavender, thus making lavender an LGBTQ+ color and icon. How can I get more information about LPB? You can email any of our board members, whose email addresses are available on our contact page. Additionally, you can subscribe to our email list and friend us on Facebook. Are there any other resources on campus provided specifically for the LGBTQQIAA community? Yes, there are. UD’s LGBT Community Office (Located in 307 Hullihen Hall) and Allies program are both resources available to the community. In fact, Haven often collaborates with these groups to achieve mutual goals. To learn about and contact these and other regional resources, visit this site. Do any of these voices sound like yours? Your identity is yours to define, not for us to assume. We will never ask how you identify. Some of the people that come to our meetings are not out to anyone and others are out to everyone. No matter what stage in the process you’re at, you won’t be alone. That’s okay, you are welcome. We have lots of members who aren’t students. You need to be a student to vote and hold office, but ANYONE can come to our meetings. We love our straight allies! We need your support to help us gain support on this campus. Please come and support us! Just because you don’t identify as queer, that doesn’t mean you can’t come to our meetings. Sorry for a late response, the best way to contact someone regarding sponsorships would be to go to our “Meet The Board!” page on our website and email our president! What is the best way to get in touch with someone regarding sponsorships? Haven is open to anyone and everyone! We meet Sundays at 6:00 pm in Trabant Room 209/211. I look forward to learning more at this Sunday’s meeting. My 26 year old is transitioning from male to female and really needs some support. Do you have to be a UD student to be involved/come to meetings? Thanks very much. Follow Haven on Twitter, Instagram, Facebook, and Snapchat (@udhaven) for more updates!